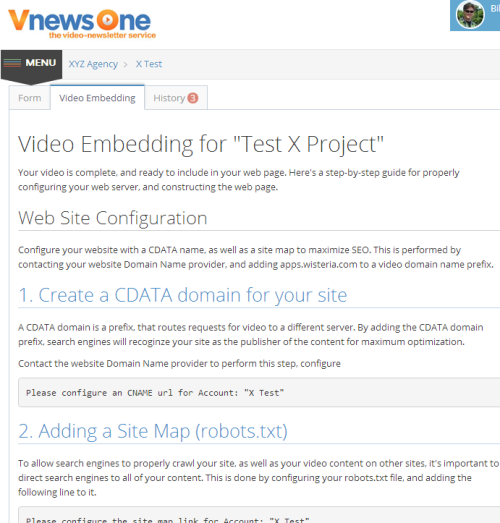 Vnews One uses the WCG:CMS framework for their custom Customer Relationship Management (CRM). The application manages projects throughout the life-cycle, from sales prospect to on-going billing, and drives users through a pre-defined workflow for video production. The process starts when Vnews One sends it's customers an application logon directly from the application. Customers logon and are automatically associated with their assigned agency and sub-account. Customers then create video projects, including video transcripts, and submit them for production. They are notified by the system when the video is complete, and the system provides detailed instructions for embedding the video in their website. WCG:ITX helped Vnews One clearly define the workflow, and developed the application. By starting with a proven platform the application development and testing process were significantly reduced.The first release was available after a short 2 week development, and was fully in production after 30 days.